A weyrcat is a winged animal that lives in a dragon's cave (a weyr). The less feathered variety (Draconis Felis, the cat dragon) presents with a feline appearance, covered in a fine pelt of tiny feathers, and naked, leathery wings. 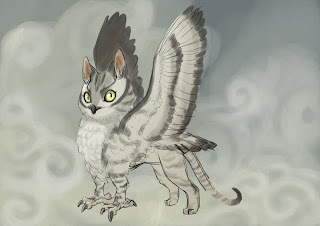 The more feathered variety (Draconis Felis Noctua, the owlish cat dragon) presents feathered wings, body, and face, and resembles an owl with a cat's body proportions and limbs. It is believed the subspecies developed a thicker feathered pelt to live in the colder environs of higher altitudes. Both varieties are well documented throughout history in various artistic mediums, most accurately, as gargoyles. Note: These animals are not to be confused with OwlCats (Strigidae silvestris), a cross between an owl and a pussycat, having an owl's body and a cat's face. Way back in the world of Win3.1 my Dad had us all create AOL ScreenNames. I chose WeyrCat; in my mind it was a Cat that lived with Dragons.. and maybe sometimes was one. The moniker stuck. When I was 15 years old Dad registered WeyrCat.Com for my birthday. I've got it for at least ten more years I think. The husband suckered me into a lab I fell completely in love with. 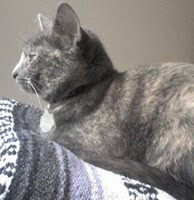 She runs from bunnies, defends you in the night from her own nightmares, and requires exactly one-third of the bed. It's o.k., I stuck him with a catnip-addicted cat that somehow built her own paper-mache nest/cave out of packing paper. I can't really list hobbies, unless my hobby is to collect hobbies. I have two alter-egos. In the Society for Creative Anachronism I am Kathryn Weir (Registered), an Irish-German pirate armed merchant and descendant of the Julianna Wilkins who captained The Leaky Dinghy (our household). I am also Jaeletha in various online games (WoW, GW2, D3). I play mainly because it fulfills my need to collect things: pets, quests, titles, random junk! I love Cross-stitch, and am trying other types of stitchery. I enjoy cooking, especially period cooking. Oh, and I like playing in Photoshop once in a while. I hike, run, go to the gym, do Yoga, scrapbook, collect owl plushies... Well, kinda. This is an example of my "collecting hobbies!" Star Trek Diplomas: All of them. I think. 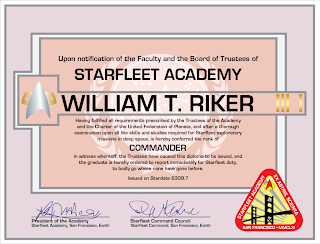 So... StarTrek.Com has released a Starfleet Academy Diploma. I wanted to see if the design was supported by canon (because I'm a huge fact-check nerd) and in my quest collected what I think to be all the diploma designs officially used on the show. I'm still looking though, so if you find one I don't have here, please leave a comment! It appears to be the first time a diploma had been shown, if rabid Trekkers diligently duplicating it is any indication. If you register at the LCARSc site, you can download a free template to make your own! Earlier in storyline, later in established canon. I can't find any epi screenshot to support this design, but it is nifty. A: Because it's neat. B: In case the file upload goes wrong. C: Look! I made it a science classroom! Look's like the one I had when I was in 7th grade science! Bangarang! Note that at this time you have to sign up and wait to be activated. There also seems to be a queue, as when I got hung up on what I think was a browser compatibility error I could not login via another browser. It pretty much told me it was too full. I enjoy the way the "game" is set up, and won't fault it for being useless if you haven't read the books, but it does make it seem a little shallow. For it's purpose, it's cool. It's a book's version of the "director's voice-over" you get in "Behind the Scenes" for movies! 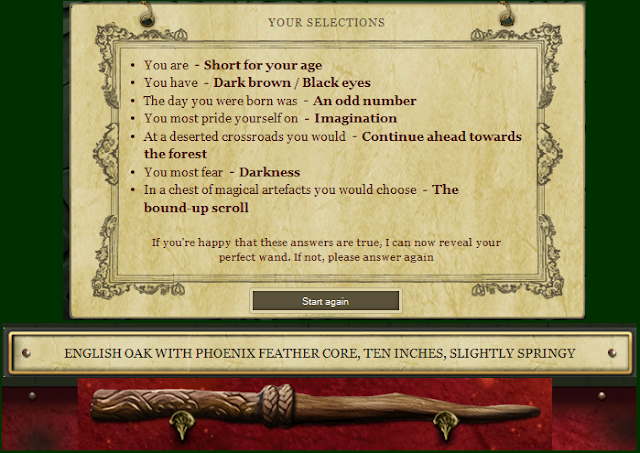 So far getting to go "shopping" in Diagon and getting my wand and house have just been awesome bonus.